This entry was posted in Uncategorized and tagged Cubiquity, PolyVox, Unity3D by David Williams. Bookmark the permalink. 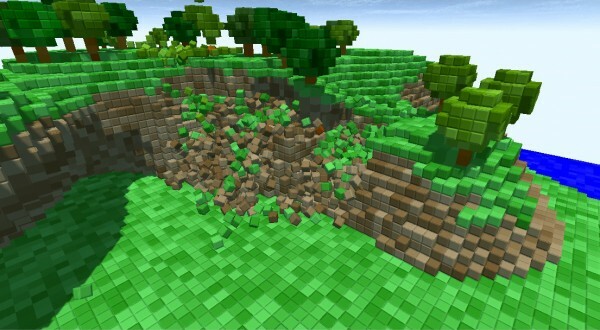 Is it normal that the Terrain Volume Collider that comes with the package doesn’t work and that I have to manually place a box collider just to be able to walk around without falling throught the terrain? – I dropped a first person controller, made sure to place it a bit above terrain and looked around while zoomed close to make sure I was above the terrain. – I check the Terrain Volume object and the Terrain Volume Collider (Script) component is attached to it. I’m using the latest free version of Cubiquity. Is that a feature only on the commercial version? Also, can you mix terrain volume and cubic terrain so that your users can place cubic blocks of terrain on a volume terrain? I’m sorry, that looks like a bug. We have a test case for physics with the colored cubes volume (which works fine) but not with the terrain volume. I’ll have to get that fixed right away. For your other question, you can place both a colored cubes volume and a terrain volume in the same scene, and they can overlap, so this let’s you achieve what you want. But if you want to make a change such as destroying part of the map then you will need to apply it to each volume separately. hello, i have a question. Can i use Cubiquity(Free version) for making a FREE game and publishing it? Yes, if you are not intending to make any money from the game then you can use the free version of Cubiquity. How do I get a commercial version of this. I spent a lot of time learning how to use this and I like it, but now found I can’t use it for my games I wish to sell. And that is a real bummer. Kind of a wast of my time to learn it only to find I can’t use it for what I intended to learn how to use it for. It is the smooth terrain I liked the most about it. I could not care less about the block terrain. Sorry I did not see up top. I see $200 for the commercial version. However that does not seem to be an option anymore. I got it from the asset store, when it showed it is for free. I don’t see how to get the commercial version anymore. And seeing that it is $200 for it, not sure I wish to pay that much for it anyways. I mostly wonted it to help me make some smooth caves, and it works real good for that. Too bad it is $200 for the commercial version, and unavailable in the asset store to buy for commercial use anyway, even if one has the money to pay it. However, I should also note that the current version is largely discontinued as we look towards Cubiquity version 2 (which will have quite a different focus).